Hello! 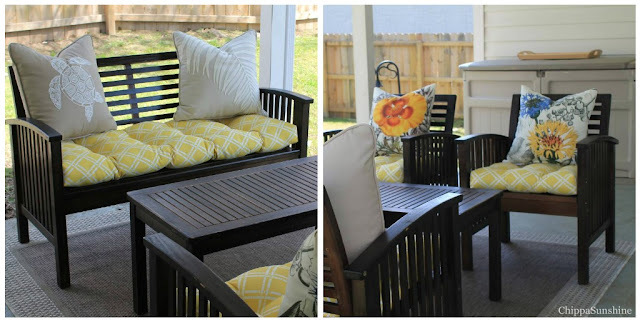 I am back with an update of our back porch. Our porch is coming along and we are almost finished with what we wanted to accomplish this year. 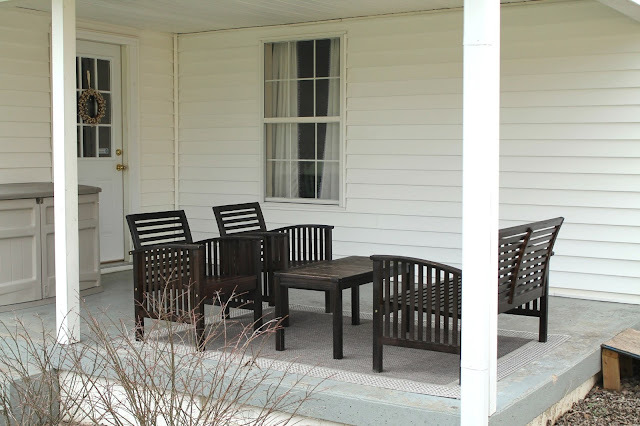 The last time I left you the porch looked like this and we had just picked out an outdoor rug. Picking out cushions for the space was relatively easy. I walked in the store picked one I like, asked Dr.J what he thought, and done. Easy! But the pillows weren't as easy. I have been in every store looking at their stock and buying and returning. Here are close-ups of what I came up with, I am not sold on my choices but I am tired of looking. None of the pillows match but each set compliments each other. My family really doesn't like pillows and they remove them every chance they get, so these lovelies might be taken back. Well, maybe just two, cause I on the other hand love pillows. I love the details on the pillow below. It adds a bit of texture to an otherwise flat surface. When it came to cushions I wanted something very fluffy and cushiony. Is that even a word!?! 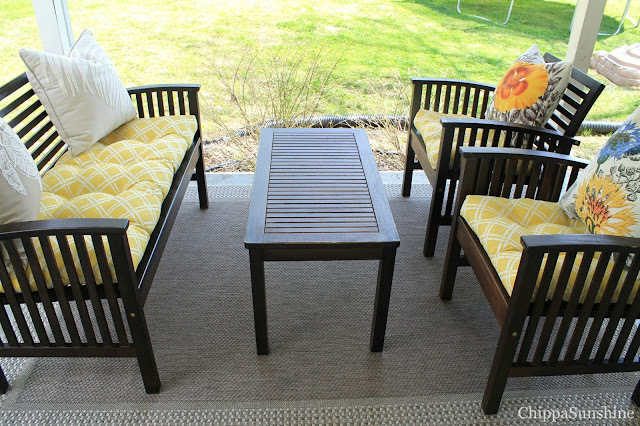 When we purchased our patio set,a few years ago, it came with these thin white cushions. We didn't like the feel of them, so this time I wanted to get something that was pillow like. The colors I am into now-a-days are yellow, green, orange and blue. 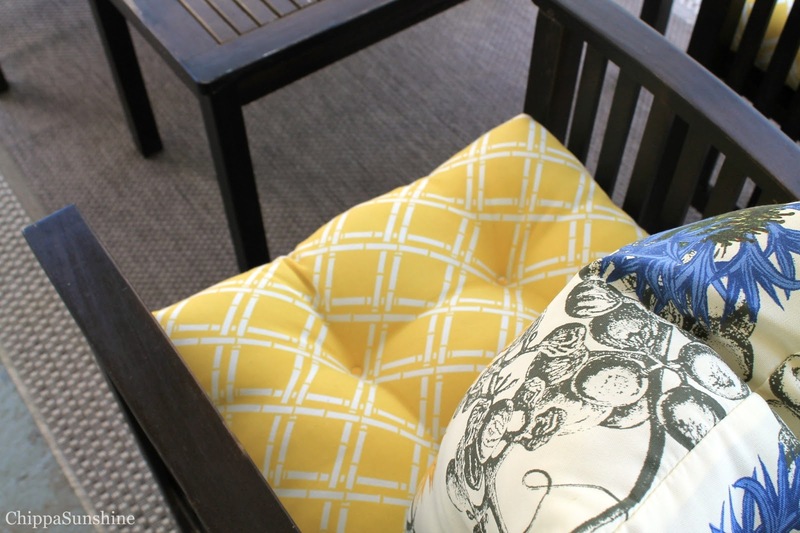 The color of the cushions is pineapple and it has a nice bamboo lattice design throughout. In this shot below, you can see the how each pillow is different from one another. 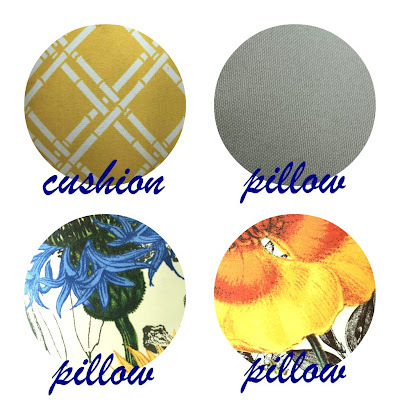 The two grayish-tan pillows are actually two different shades. Can you tell? I am in love with the Mr. Turtle pillow, he is so cute. The next thing I will be doing in the space is finally hanging my outdoor curtains. I have had these curtains for over a year now, it's about time to get them up. Let revisit my to-do list for the back porch. Tell me what you think of the space so far. 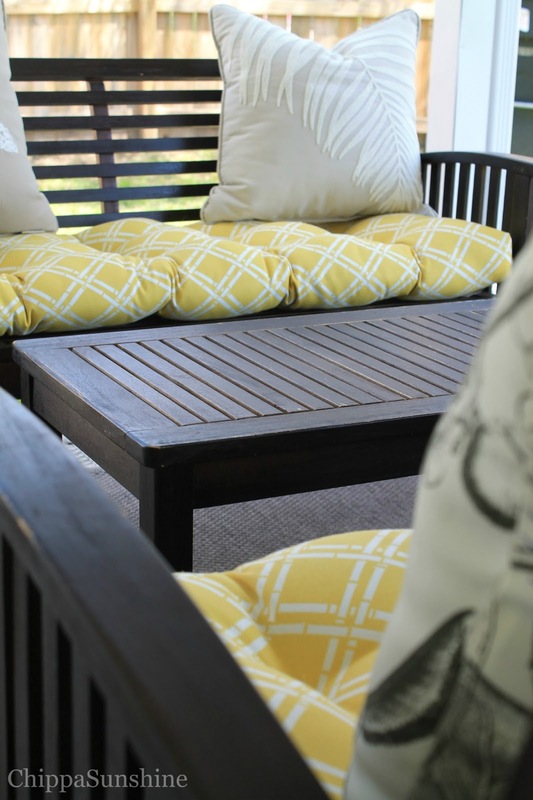 Have you started decorating any outdoor spaces lately? I still have to build my garden planter. See ya soon! Sources: Cushions: Newport All Weather from HomeGoods; Pillows: Island Living from HomeGoods and Threshold Cali Poppy and Botanical Bachelor Buttons at Target. Your porch looks so sweet, love the pillows especially the floral ones! :) I can't wait to decorate our outdoor spots, I have big plans for our front porch on a tiny budget! The floral ones add that vibrate pop of color I wanted for the space. Speaking of budgets I almost blew ours out the water with buying pillows. Why are they so stinking expensive? It's coming together so nicely. I love the pillows you chose for chairs. I like that they are not all matchy-matchy. I know you mentioned refinishing the concrete. Have you heard of a product called ReStore? I just discovered it through HomeTalk. I'm anxious to give it a try for our deck. Thanks Christina! We hope to have everything accomplished by the end of summer. That is all except the fan, that might have to wait until next year. Its looks very good. I feel inspired to do something with my empty patio. The porch is missing something; Hey, what's that ramp for...? NICE POST Darnetha. Beautiful! I love the bright yellow. Of course, the furniture, itself, is beautiful, so the pillows are just a lively addition. Glad to have found you through Brandi's blog. Take care! Thanks Cynthia for stopping by! I am glad you like my little pillow addition to my porch. Just came across your blog today and it's super inspiring! Love the porch. Looks like its going to make for some awesome summer relaxation! I hd decorated my bedroom & living room with designer pillows. Here I like grayish-tan pillows a lot.